The above picture depicts Mary seated in front of a wide valley, beside a tent, next to a camp stool and table full of medicine bottles. Mary is wearing a military looking outfit (thought to have been self-designed). This is the last picture of Mary, taken around 1873. The reason for its commission is unknown. Mary Seacole was born in Jamaica more than 200 years ago. This was during the period when many black people in the Caribbean were forced to work as slaves. Although Mary’s mother was black, her father James Grant was a white Scottish army officer and Mary was born a ‘free person’. She had a sister, Louisa, and a brother, Edward. Mary’s mother ran a lodging house, called Blundell Hall, which was much respected by local people in Kingston, Jamaica’s capital city. But she was also a healer and taught Mary many of her skills using traditional Jamaican medicines. By 1818, aged 12, Mary helped run the boarding house, where many of the guests were sick or injured soldiers. Three years later, she travelled to England with relatives and stayed for about a year. It was an opportunity to acquire knowledge about modern European medicine which supplemented her training in traditional Caribbean techniques. In 1823, Mary went to London on her own, remaining there for 2 years. She experienced racist comments while in London. She describes herself as “only a little” brown, but her friend was very dark so London boys made fun of their complexions. However, Mary’s companion was hot-tempered, and because there were no police officers around it was quite eventful! During 1825, her travels included Cuba, Haiti and the Bahamas, returning to Kingston in 1826 to nurse her patroness in a long illness. Mary married Edwin Horatio Hamilton Seacole on 10th November 1836. They set up a store at Black River, but Edwin became unwell and delicate so Mary would nurse him as best as she could. Sadly, Edwin died in 1844, followed closely by the death of her mother. These deaths devastated Mary. This photograph of Mary Seacole was discovered in the library at one of Britain’s oldest public schools, Winchester College. The exciting discovery was made in 2009 by Dr Geoffrey Day, Fellows’ and Eccles Librarian at the school. It was contained within an elegant private campaign scrapbook compiled by former Coldstream Guards officer Ely Duodecimus Wigram (1802-1869). In 1916, it was presented to the Library of Winchester College by the then Headmaster. But in 1850, she nursed victims of the Kingston cholera epidemic. travelling to Panama in 1851 only to find that her skills were needed once again because the town of Cruces was suffering its own outbreak of the disease. In 1853, Mary returned to Kingston, caring for victims of a yellow fever epidemic. She was invited by the medical authorities to supervise nursing services at Up-Park in Kingston, the British Army’s headquarters, and she re-organised New Blundell Hall, her mother’s former lodging house rebuilt after a fire, to function as a hospital. Mary had no children of her own, but the strong maternal attachments she formed with these soldiers, and her feelings for them, would later drive Mary to the Crimea. The Crimean War lasted from October 1853 until February 1856. It was fought by a coalition including Britain, against the Russian Empire. Mary travelled to England and approached the British War Office, asking to be sent as an army nurse to the Crimea where she had heard there were poor medical facilities for wounded soldiers. She was refused. Undaunted, she funded her own trip to Crimea, now part of Ukraine, where she established the British Hotel with Thomas Day, a relative of her husband, Edwin. The hotel provided ‘comfortable quarters for sick and recovering soldiers’. At the time, Mary was as well-known in Britain as Florence Nightingale. Ms Nightingale’s famous military hospital was situated hundreds of miles from the frontline in Scutari (now called Üsküdar, just outside the Turkish city of Istanbul). But Mary’s hotel near Balaclava was much closer to the fighting. Mary was able to visit the battlefield, sometimes under fire, to nurse the wounded. Indeed, she nursed sick soldiers so kindly that they called her ‘Mother Seacole’. When the war ended, Mary went back to Britain with very little money. Soldiers wrote letters to newspapers, praising what she had done. The Times War Correspondent, Sir William H Russell, wrote of Mary in 1857: “I trust that England will not forget one who nursed her sick, who sought out her wounded to aid and succour them, and who performed the last offices for some of her illustrious dead”. 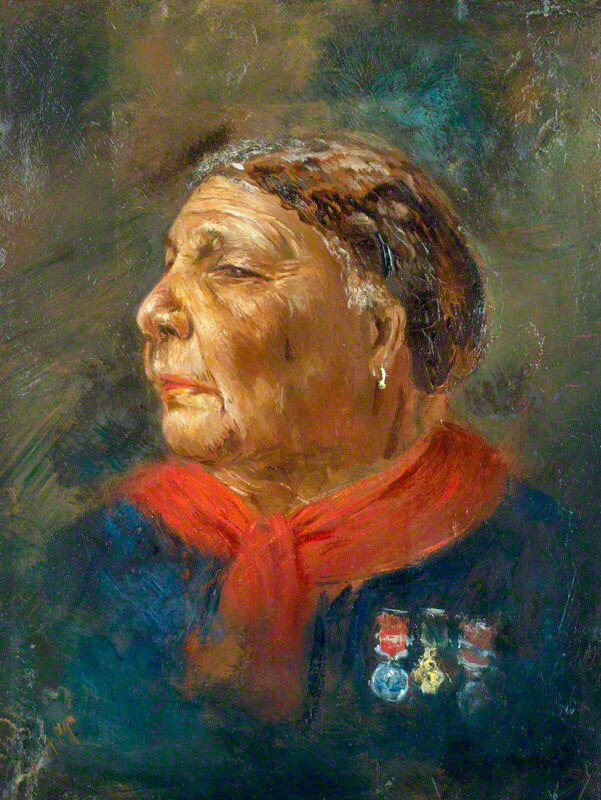 British artist Albert Charles Challen (8 October 1847 – 1 September 1881) is best known as the painter of this portrait of Mary Seacole when she was around 65 years old. The picture is on display at the National Portrait Gallery in London. All those who admired her came to her aid, whether soldiers, generals or members of the Royal family. In 1857 a fund-raising gala was held for her over four nights on the banks of the River Thames. Over 80,000 people attended. The same year she published her autobiography, The Wonderful Adventures of Mrs Seacole in Many Lands, which became an instant bestseller. Mary died in London in 1881. Unfortunately, she was then lost to history for around 100 years until nurses from the Caribbean visited her grave in North West London, where the local MP, now Lord Clive Soley, promised to raise money for a statue for Mary. In 2004, Mary was voted the Greatest Black Briton. Lord Soley launched the campaign for a statue after leaving the House of Commons. In 2016, the statue was finally unveiled in the grounds of St Thomas’ Hospital on London’s Southbank. Her legacy is continued by the Mary Seacole Trust (MST) which, as well as maintaining the statue, aims to educate and inform the public about her life, work and achievements, ensuring that she is never again lost to history. Mary Seacole is a great role model. Her values of good citizenship (she always wanted to help the sick and wounded), entrepreneurship (her drive took her to the Crimea under her own steam) and achievement (she remains one of history’s greatest figures) hold true today.